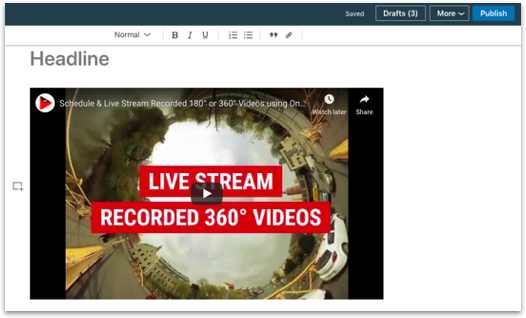 How to live stream pre-recorded videos to LinkedIn? What is custom RTMP link streaming? Schedule a live stream on YouTube via OneStream. Make sure to schedule the video at least 15 min in advance. Visit LinkedIn and click write an article. Click the small Plus Sign, select the option Video. URL can be copied from the streaming destination (e.g YouTube) or can be taken while the video is in preparing state in OneStream. Simply click the video in scheduled tab in your OneStream dashboard and it will take you to the stream link. Your video will appear in the article. Add the headline and publish the article. Your stream will be live at the set time and date. Only URL of videos on YouTube or Facebook Page will work. Facebook Profile and Group videos will not work for LinkedIn live stream.